In Part I of this three-part series on living the Hamakua life, I highlighted a variety of my new land listings in Pepeekeo, one of several quaint towns along the Hamakua Coast that has grown in popularity in recent years. In this post, I’ll showcase East Hawaii land opportunities in Ninole, Hakalau, and Honomu. Why Move to Hawaii’s Hamakua Coast? People move to the Hamakua Coast for a variety of reasons. Known as the breadbasket of Hawaii, the region boasts some of most fertile soil in the state in addition to spectacular views of waterfalls, the Pacific Ocean, and the coastline. Whatever your reason for wanting to live the Hamakua life, there’s a parcel of land that best suits your needs whether it’s a 0.3 acre size oceanfront lot or 20 acres of prime farmland. 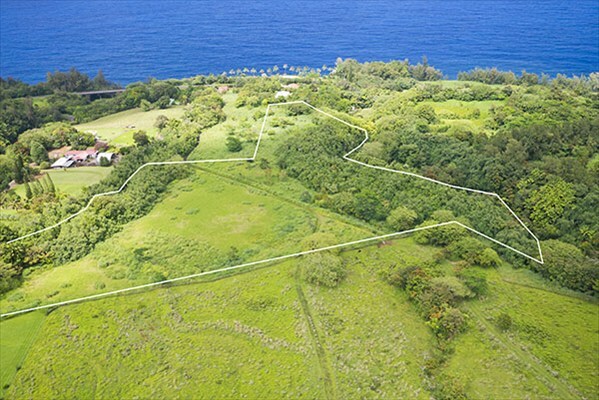 If you want to build a Hawaii oceanfront home with acreage, you’ll like this 10-acre property in Honomu (MLS# 253769). 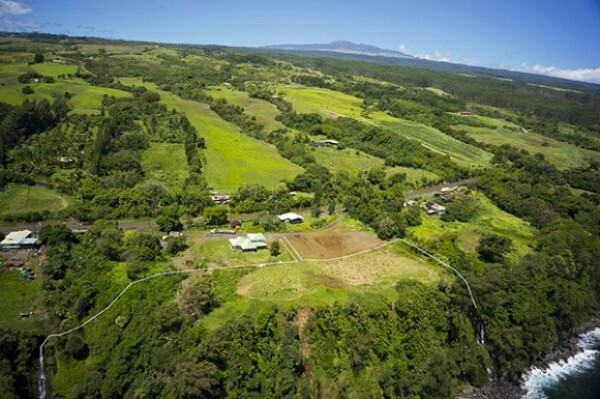 Listed at $345,000, the land is bordered by Highway 19 and Kolekole Gulch offering ocean, Mauna Kea, and Kolekole Gulch views. The property is super convenient – just five minutes from the Honomu post office, restaurants, bakery, and shops. Perhaps you want the combination of Hamakua oceanfront property with a couple of acres of land. This 2.5-acre Ninole property (MLS# 255393), listed at $425,000, comes with 765 feet of uninterrupted oceanfront. As if that weren’t enough, there’s a waterfall at each end of the property with Kooheiki Stream dropping dramatically to the sea on the north end of the property and Waikolu Stream entering the ocean at the south end. 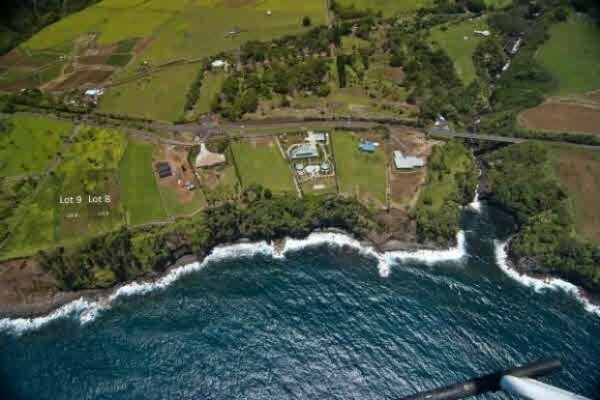 Located on Highway 19, this property is a quick 20-minute drive into Hilo, Hawaii’s second largest city. You can learn why it’s a sought after area to live and the benefits of living in Ninole in my blog. If you’re looking for something much smaller in size, then this Honomu property fits the bill. Listed at $120,000, this 0.3-acre lot (MLS# 255337) overlooks Paheehee waterfall and gulch. A San Francisco architect has already drawn plans for a home or you could design your own ideal Hawaii home. What’s more, the adjoining lot is also for sale (MLS# 255263) for $650,000 complete with a plantation manager’s house. You could purchase both and build another home to sell or use as rental income. 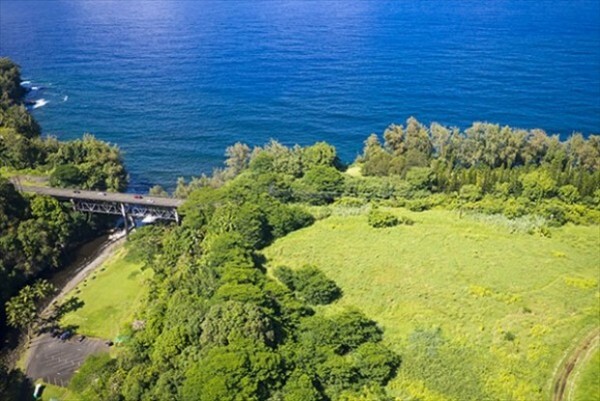 Another opportunity to build your dream Big Island oceanfront home is this Hakalau oceanfront property that recently came on the market. Located in Umauma Falls Estates, this 1.9-acre parcel (MLS# 258176) is in the most prestigious subdivision on the Hamakua Coast. Adjacent to several multi-million dollar estates, this East Hawaii oceanfront property is listed at just $375,000 and offers panoramic views of the Pacific Ocean, Hamakua coastline, and Mauna Kea. Hakalau is a highly desirable area for many people retiring to the Big Island, making this property an excellent opportunity. You can read my blog to learn more about the benefits of living in Hakalau. Those preferring to live in a more secluded area inland, but still want ocean views may prefer this 13.4-acre Ninole property (MLS# 256852), listed at $345,000. The property comes with its very own waterfall! The property comes with its very own waterfall! 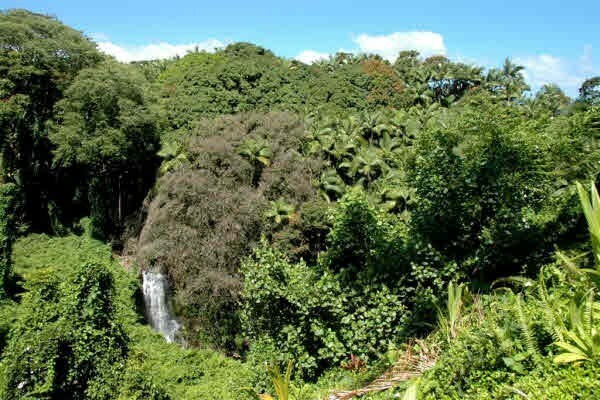 In addition, this private Hamakua estate has streams on each side of it and a fresh water spring that feeds Waiehu Stream. Unlike some area properties that are off the beaten path, the property comes with a paved driveway for easy access. The Hamakua Coast is a wonderful place to live. I should know – for nearly two decades my family and I have lived here, drawn by the spectacular waterfalls, lush greenery, and tropical flowers. If you’d like to find the perfect property for your Hamakua life, give me a call today.